The importance of the digestive tract is obvious when thinking in terms of obtaining nutrients, energy metabolism and expelling waste, however its protective functions are often overlooked. The small and large intestines provide a barrier between things that are consumed – such as food, medications, pathogenic organisms or insoluble matter – and the blood vessels that transport material to all other organs of the body. For this reason, the intestinal tract is closely interconnected with the immune system, acting as the first line of defense against “offenders”, or antigens, that enter this system and differentiating them from molecules necessary for life. Inflammatory responses triggered in reaction to foreign substances in the gastrointestinal (GI) tract are not uncommon but are usually resolved quickly. Chronic inflammation though can be extremely problematic, and damage created by inflammation that causes penetration of the intestinal barrier can lead to a host of other, more serious complications. Crohn’s disease typically includes periods of remission when inflammation and symptoms subside with occasional flare-ups. Symptoms may range from mild to severe and generally depend upon the part of the digestive tract involved. Although it affects all age groups, onset of symptoms generally occurs between ages of 15 and 30. Because of the involvement of the immune system, symptoms may also appear outside of the digestive tract as well. As Crohn’s disease progresses, many complications can arise. Gastrointestinal complications such as strictures, obstructions or fistulas can require surgery to remove affected areas, but procedures do not address the inflammatory disease itself. After operation, there is a high frequency of recurrence of Crohn’s disease, showing inflammation in 93% of persons 1 year after surgey.5 Long-standing Crohn’s disease patients have a higher risk of developing cancer, predominantly in the small intestine but also the colon if that is where the majority of inflammation occurs. 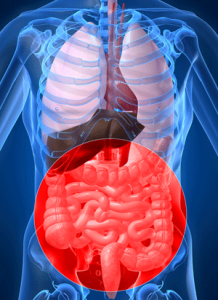 Regular colonoscopies should be conducted to monitor the activity of the intestines. Malnutrition is often a problem due to the inability to properly absorb nutrients from the damaged intestines. Common deficiencies include vitamin B12, folic acid, iron and fat-soluble vitamins. Some people develop anemia because of low iron levels caused by malabsorption, bloody stools or the intestinal inflammation itself. Crohn’s disease also might delay puberty and retard growth in children or adolescents that contract the disease because they are not receiving the necessary nutrients from food. As there is no cure for Crohn’s disease, treatment options are designed to reduce inflammation, lessen symptoms and severity, and return to/remain in periods of remission. Treatment might involve medications, nutritional supplements, surgery, or a combination of these therapies. Drug treatment is the main method for relieving symptoms. Anti-inflammatory drugs such as corticosterioids are used to decrease the inflammation and allow for healing, although long-term use of corticosteroids may have debilitating side effects such as osteoporosis. Immunosuppresive agents are also used to prevent the immune system from attacking the body’s own tissues and causing further inflammation. Surgical interventions are left as a last resort for it is not curative in Crohn’s disease, but about 75% of persons will require surgery at some point in time (especially for complications).5 Adjusted diets and restricted foods are often a part of Crohn’s therapy as well. 1. Lashner B. Inflammatory bowel disease. In: Gastroenterology 2009 Current Clinical Medicine. Elsevier; 2009. 3. Baumgart DC, Carding SR. Inflammatory bowel disease: cause and immunobiology. The Lancet. 2007; 369(9573):1627-40. 4. Sugimura K, Taylor KD, Lin Y, et al. A Novel NOD2/CARD15 Haplotype Conferring Risk for Crohn Disease in Ashkenazi Jews. Am J Hum Genet. 2003; 72(3): 509–518. 5. Post S, Herfarth C, Böhm E, et al. Endoscopic evidence for recurrent inflammation is present in 93% of persons 1 year after surgery for Crohn’s disease. Annals of Surgery. 1996; 223(3):253-60.